Manufacturing test, R&D, development and service applications demand performance and flexibility from a bench meter. The Fluke 8808A 120V, 5.5 Digital Bench Multimeter delivers a wide variety of measurement functions, including volts, ohms, and amps, plus frequency —all at superior accuracy and resolution with a basic VDC accuracy of 0.015 %. The Fluke 8808A 5.5 digit multimeter has a broad range of functions, measuring volts, ohms and amps with a basic V dc accuracy of 0.01 %. The Fluke 8808/A is remarkably easy to use, even by unskilled operators, because it makes the measurements you perform most often extremely easy and fast to do. Six setup buttons on the Fluke 8808-A front panel operate like a car radio's station pre-sets. Simply set up the meter for a common measurement, then press shift followed by a setup button (S1 to S6) to save the setup. Now each time you perform that measurement, you simply press the appropriate setup key. It's that easy! 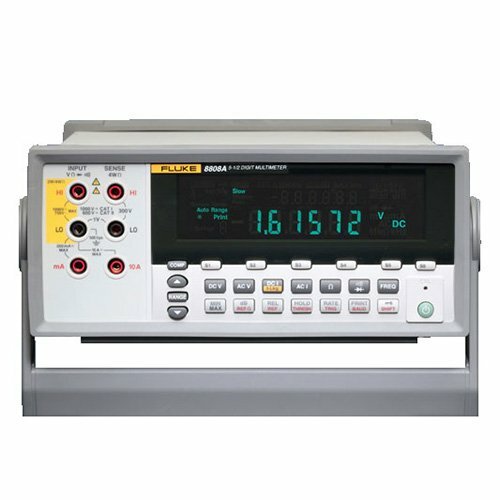 Typical multimeters use a shunt method to measure current, creating a measurement burden voltage that increases the error in low current measurements. This makes it difficult, if not impossible, to perform tasks such as determining the true leakage current on a battery-powered device while it is powered down, or measuring small currents in sensitive circuits. The Fluke 8808A is the only multimeter in its class to use a low-impedance operational amplifier and current-to-voltage conversion technique to eliminate the burden voltage and measure sensitive low currents. In this special mode, the Fluke 8808 A Digital Benchmeter can accurately measure small currents with a resolution of up to 100 nA. Six setup buttons on the Fluke 8808A front panel operate like a car radio's station presets. Simply set up the meter for a common measurement, then press shift followed by a setup button (S1 to S6) to save the setup. Now each time you perform that measurement, you simply press the appropriate setup key. Operators no longer need to press multiple buttons to make a measurement. Whether you are performing functional tests or making critical measurements on test points, using the limit compare mode with pass/fail indicators eliminates mistakes, especially those where results are "on the edge." The Fluke 8808A display has built-in enunciators that clearly show whether a test passes or fails. The pass/fail indicators take the guesswork out of testing: the result is either within limits or it's out! Patented split terminal jacks for 2x4 Ohms function allow you to perform precise 4-wire low ohms measurements with only two leads instead of four. Optional test lead accessories are available to enable you to establish a 4-wire connection even in tight spaces or on surface mount devices.